I found this post on Gala Darling and just had to share it with you all so you can get involved too. Let’s kick it off with a photo of your favourite flowers. Roses, peonies, ranunculus? Show us what you love, and tell us why! What are you nostalgic for? What do you miss? Show us one of the best times of your life. Taking photobooth pictures on a Friday is an underrated tradition. Squeeze into a booth today and share the results, or just go through some of your old favourites! This could be anything, from street art to your favourite comedian. The only criteria is that it has to make you laugh. How do you keep yourself going every day? What words do you tell yourself, and what quotes keep you feeling inspired? You never know, your daily mantra could be exactly what another #lovetober babe needs to see right now. There’s nothing more revelatory than looking at someone’s bookcase, so show us: what’s on yours? And if your bookshelf is huge, give us a glimpse of the stack you’re working on! Time to get grateful. Your photo can be anything, but this is one prompt where your caption will really count. Make us a list of at least 10 things you’re glad to have in your life! What’s your power colour? What colour makes you feel like you’re “on” when you wear it? What is it about that colour that makes you feel so damn good? Who or what inspires you? There are no wrong answers here, and feel free to get weird! …Yep, just like Van Halen says! Take a photo of you in flight! What would your perfect weekend look and feel like? This is your opportunity to create a beautiful weekend for yourself, then share the results. How sublime. Ever get something stuck in your head that you just cannot stop thinking about? Me too! So, what are you really obsessed with right now? What is the most beautiful place you’ve ever seen? Share a photo of you standing right in the middle of it, or simply your favourite view of all time. Do something good for someone else today — pay for a stranger’s coffee, give your time to a cause, or help out a friend — and then tell us all about it. What’s your big desire? Tell us about that thing that burns inside of you, that terrifies and exhilarates you in equal amounts. Who knows: maybe one of us can help you make it a reality! Whose art really speaks to you? Is there one specific artist whose work lights you up inside? Share one of your favourite pieces, and be sure to tag and attribute the artist so we can explore their work, too! What do you do every morning? Show us that quiet moment before you start your day: a cup of tea, a stroll with your dog, a moment on the yoga mat. What’s on your list of things to do before you die? Bonus points if you scribble it down so that we can see your handwriting! Do you have a favourite city? Show us a photo and tell us why it is so special to you. And no worries if you’ve never been there: my favourite city was New York, even before I had ever set foot in it! It’s time for your best friends to get their moment in the sun. Who are your best babes, and what makes your friendship so remarkable? Takin’ it way back! Share your silly old photos, and bonus points if it’s a picture of you as a child. How do you define spirituality? What is your connection to God, universal energy, love? What does the word “spirituality” mean to you? Find a picture of yourself from ten years ago, and use an app like PictureFrames to place it alongside a photo of yourself today. How have you changed, grown, and transformed in that time? How do you take care of yourself? Epsom salt baths, massages, non-negotiable nap-time? What’s the most challenging thing you’ve ever experienced, and what did you learn from it? How did it change you and make you a stronger person? Don’t be shy or ashamed: this is all part of your story, and it’s what makes you so magical today. What do you keep next to your bed? Yes, this one is pretty intimate, but says a lot about a person, I think! Give advice to your fellow #lovetober participants. What do you wish you could tell everyone? How are you celebrating halloween? Will you decorate your house, dress up like a vampire, or commune with spirits? Let us in on your spooky world! It’s easy-peasy. Either save the image above — or like it on Instagram — so you have a reminder of the prompts on-hand! Then, use the prompts to spark your creativity. 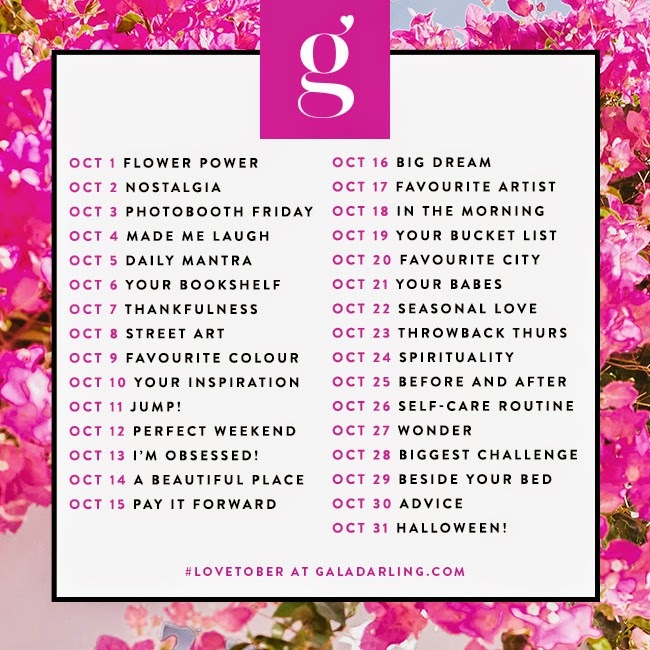 Take photos, upload them to Instagram, and be sure to tag them with #lovetober!